I am very frustrated right now…I have been typing away for a while, I hit the save button, and there it went – everything I typed was gone. I am SO FRUSTRATED!!! Ok, I will try to calm down as I try to recreate this post. I was really on a role, and now my mind is blank. It is time for me to post my annual Passover recipe, although I am not sure anything can top my grandmother’s Matzo Ball Soup – this actually comes close. But before we get to that…let’s talk about what we call today in our house – Bunny Day!!! My younger daughter is OBSESSED with bunnies. It all started when she was born, and a good friend of my mother’s sent her some things from this darling store north of Seattle, called Bunnies by the Bay. They actually sell their stuff all around the country (my mother’s friend lives in Tennessee), but it is a local business for us. She sent her a bunny blanket which is her favorite bedtime buddy, best friend, and the one thing she goes to when she is sad. Her whole world now revolves around bunnies – so you would understand when she received an invitation to a Bunny Birthday Party, that her head just about exploded. At this birthday party, each girl got to hold their very own bunny for the entire party – she could hardly contain herself. Needless to say, it was one of the best days of her life. Even though we don’t celebrate Easter, she wore her bunny ears all day today to celebrate. So, back to Passover. There are not many Passover recipes that warrant you to drop everything and run to the kitchen. This happens to be one. My neighbor introduced me to this recipe years ago – she is a fabulous cook, and always has such perfect recipes for the holidays. She made a batch of these, and I fell in love. I am telling you – you do not have to celebrate Passover to enjoy these babies. A few years ago, she sent me this…the first blog post I ever read. It was after I read this post, that I started thinking about creating my own blog. So please enjoy my other favorite Passover recipe – I only wish my grandmother was still alive so I could share it with her – she would have loved it. All you need is some Matzo Ball Soup and some Matzo-Almond Roca – who needs anything more than that? 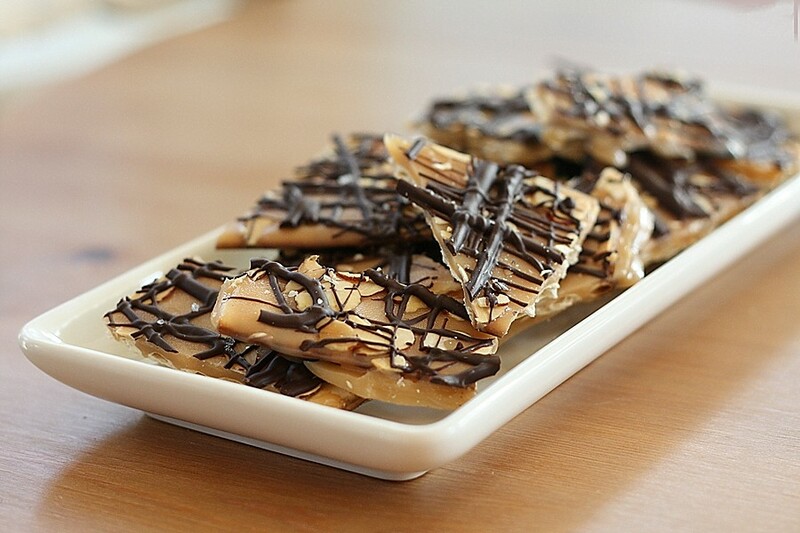 Drizzle melted chocolate over caramel. Sprinkle salt over. Let stand until chocolate sets, about 30 minutes. Break into pieces. Oh! I can feel your frustration…been there all too often. Urgh. Bunny day! I like that. :) This dessert looks very good. I had no idea there were so many uses for matzo until this year. Hope you had a wonderful holiday! I’ve wanted to make these ever since I saw the recipe on David Lebovitz’ blog. You’ve inspired me – this year may be the year! Thank you SO much for these! They were such a light and sweet treat. I LOVED the matzo addition! YUM.